Cor triatriatum dexter is a rare congenital heart anomaly where the right atrium is divided into two chambers by a membrane. We report a boy who had persistent mild cyanosis and diagnosed to have cor triatriatum dexter with secundum atrial septal defect by transoesophageal echocardiography. Interestingly, he had persistent mild cyanosis despite insignificant obstruction to the right ventricular inflow and normal pulmonary artery pressure. The pathophysiology, approach to the diagnosis, and mode of treatment are also discussed. A 9-year-old boy was admitted to a local district hospital for pneumonia. After one week of treatment with antibiotics, he was asymptomatic and there was no more sign of respiratory distress. However, his oxygen saturation persistently ranged from 88 to 92%. 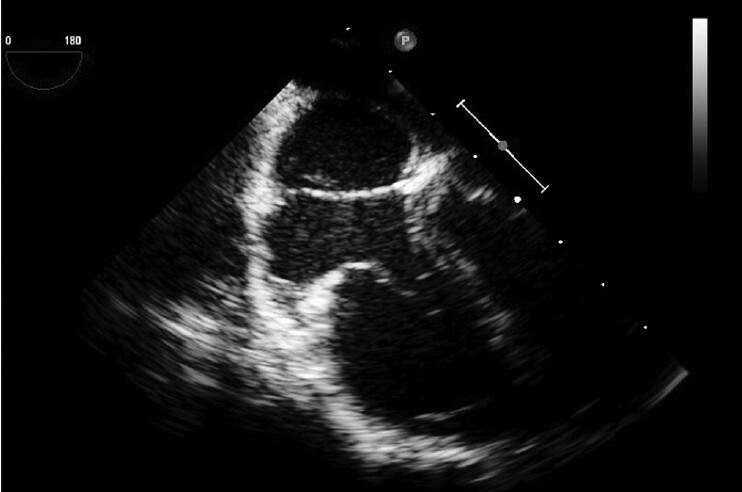 Initial transthoracic echocardiography (TTE) showed a structurally normal heart. He was referred to our hospital for further assessment. Clinically, he had mild cyanosis. Other clinical examination including the cardiovascular system examination was unremarkable. Evaluation with TTE showed a normal heart anatomy. However, contrast echocardiography demonstrated a right-to-left shunting at the atrial level. 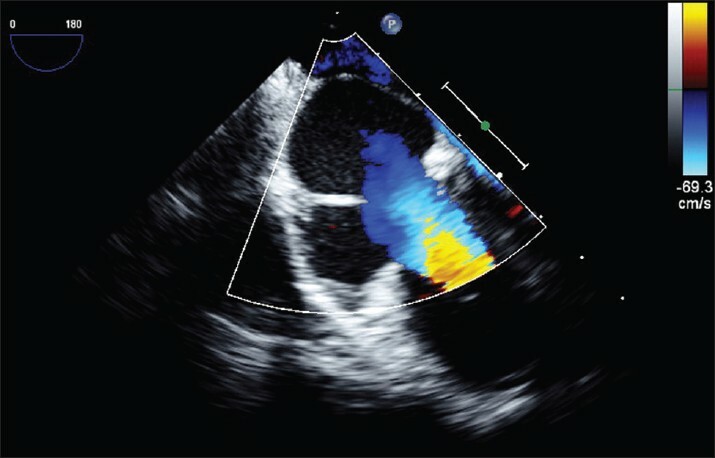 Subsequently, a transesophageal echocardiography (TEE) showed a membrane across right atrium [Figure 1] without causing obstruction to right ventricular inflow [Figure 2]. There was also an anterior secundum atrial septal defect (ASD) and the bubble study showed an immediate right-to-left shunting through the ASD [Figure 3]. His cardiac catheterization showed a normal hemodynamic study. Two months later, surgical resection of the cor triatriatum dexter membrane and patch closure of ASD were performed. Postoperative echocardiography showed the minimal residual membrane of the cor triatriatum dexter with no residual ASD shunting. Clinically, he remained asymptomatic and his saturation improved to >95%. Unlike cor triatriatum sinister, which carries a high mortality rate if not repaired, cor triatriatum dexter has varying clinical manifestations depending on the degree of partitioning or septation of the right atrium. When the septation is mild, the condition is often asymptomatic and is an incidental finding during surgery to correct other cardiac abnormalities or during echocardiography. More severe septation can cause right-sided heart failure and elevated central venous pressures due to obstruction of the tricuspid valve, the right ventricular outflow tract, or the inferior vena cava. Cor triatriatum dexter can occur as an isolated cardiac anomaly or associated with other malformation of right heart structures such as pulmonary artery stenosis or atresia, tricuspid valve abnormality, ASD, and Ebstein anomaly. , Cyanosis is a very rare presentation of this condition. Hoye and colleagues reported a neonate with cor triatriatum dexter with cyanosis and assessment showed significant obstruction to right ventricular inflow. Most of the flow was directed to the left atrium through a patent foramen ovale. Our patient has an ASD that allows the deoxygenated blood from right atrium to flow across it and mix with oxygenated blood in the left atrium that led to mild degree of cyanosis. Interestingly, this happened despite insignificant flow obstruction to right ventricle and normal pulmonary artery pressure. One possible explanation is that the membrane acts as a venous valve that directs the blood flow from right to left atrium. 1. Embrey RP. Cor triatriatum, pulmonary vein stenosis, atresia of the common pulmonary vein. In: Mavroudis C, Backer CL, editors. Pediatric cardiac surgery. 2 nd ed. St Louis: Mosby-Year Book; 1994. p. 503-4. 2. Arrants JE, Riopel DA, Catalano PW. Cor triatriatum: Preoperative diagnosis and successful surgical correction in a ten-week-old infant. Chest 1973;63:1027-8. 3. Ott DA, Cooley DA, Angelini P, Leachman RD. Successful surgical correction of symptomatic cor triatriatum dexter. J Thorac Cardiovasc Surg 1979;78:573-5. 4. Mazzucco A, Bortolotti U, Gallucci V, Del Torso S, Pellegrino P. Successful repair of symptomatic cor triatriatum dexter in infancy. J Thorac Cardiovasc Surg 1983;85:140-3. 5. Hoye DJ, Wilson EC, Fyfe DA, Guzzetta NA. Cor triatriatum dexter: A rare cause of neonatal cyanosis. Anesth Analg 2010;110:716-8. 6. Burton DA, Chin A, Weinber PM, Pigott JD. Identification of cor triatriatum dexter by two-dimensional echocardiography. Am J Cardiol 1987;60:409-10. 7. Fiorilli R, Argento G, Tomasco B, Serino W. Cor triatriatum dexter diagnosed by transesophageal echocardiography. J Clin Ultrasound 1995;23:502-4. 8. Baweja G, Nanda NC, Kirklin JK. 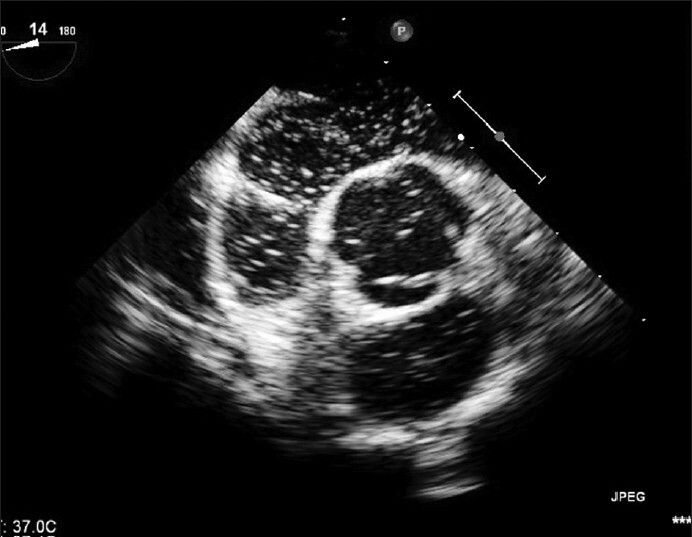 Definitive diagnosis of cor triatriatum with common atrium by three-dimensional transesophageal echocardiography in an adult. Echocardiography 2004;21:303-6. 9. Masui T, Seelos KC, Kersting-Sommerhoff BA, Higgins CB. Abnormalities of the pulmonary veins: Evaluation with MR imaging and comparison with cardiac angiography and echocardiography. Radiology 1991;181:645-9. 10. Savas V, Samyn J, Schreiber TL, Hauser A, O'Neill WW. Cor triatriatum dexter: Recognition and percutaneous transluminal correction. Cathet Cardiovasc Diagn 1991;23:183-6. BojaniÄ‡, K. and BursaÄ‡, D. and Zmijanac, J. and DuiÄ‡, Z. and Scavonetto, F. and Weingarten, T.N. and Sprung, J.